Next week, much of the country will participate in the annual fun of trying to choose which college basketball teams will do best in the NCAA national basketball championship tournament. They will get the brackets, print them out or make their picks online. Have fun! And hope for the best. Picking the winning teams can be like investing. There are many different approaches. Some make sense. Some don’t. Some are effective, some are not. 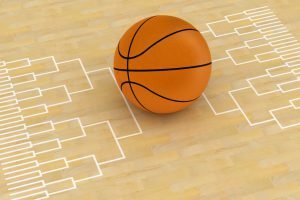 We cannot help you to have the top, most successful bracket selections to win your basketball pool, but we want you to do well. To outperform all the other people in a basketball pool, you have to take risk, and likely a lot of risk at some point. You have to get lucky. You probably need to choose some long shots and try to predict some upsets that you hope will occur along the way. You have to take some chances, if you want to outperform all the other entrants. We work with realistic goals and we want to help you to succeed financially. When we make investment recommendations and structure a portfolio for you, making you the absolute most money is not our goal. That would require taking on too much risk for most people. That is not our approach or our philosophy. Our goal, and we think yours as well, is to perform well. It means that we make solid decisions and use processes and philosophies that strive to set you up for the best chance of financial success, in an unknown and unpredictable world. We believe in globally diversified portfolios. We believe that utilizing low cost mutual funds is vital, as striving to minimize your costs makes a difference over the long term. We use tax managed funds when possible, to strive to reduce your taxes. When you fill out your brackets, you can use different approaches. You can choose teams that you know. You can base your selections on past winners or the team colors. You can choose against Duke, if you don’t like them, just because. All of these are emotionally based decisions, not a rational process for decision making. We use rational thinking, not emotions, when making investment decisions. You can go with the favorites. This would be quite logical, the vast majority of the time. The college teams are seeded by a group of people (the selection committee) that spends a huge amount of time to analyze the teams, their records and all sorts of other data. The committee seeds the teams in each of the four regions from 1-16. If you do this every year, and you base your picks on the seedings and choose the favorites until the Final Four, you will most likely do pretty well. You will probably not win a pool in any given year. But we doubt that you will be consistently near the very bottom of your pool most of the time. You will likely have far more success than failure, in terms of your overall long term performance. This is similar to the strategy that we adhere to for picking stocks. We don’t strive to pick the major upsets. We don’t pick individual stocks. We go with the approach that the “committee” is pretty smart and that will lead to good long term performance, better than most others over the long term. This is in contrast to people who actively try to pick and choose lots of upsets and underdogs. Who they think will do the best, even though the future is unknown. You can spend hours reading all sorts of “experts” on various websites or listening to other “experts” on TV or talk radio programs. You could even pay for access to certain websites or information, because you think they are really in the know. You can follow this type of advice, but do you know how they performed last year? Or the year before? And even if you identified an “expert” who did well in the past, how do you know that will lead to good (or outstanding) performance in this year’s tournament? It probably does not! They most likely got lucky one year. They picked a team that turned out to be hot and rode that to glory. Or, it’s just their job to be the “expert” and they are good at doing predictions and interviews in the media. So even if you find the best expert and follow their advice, wouldn’t others eventually also learn about them? Over a few years, if someone was really able to consistently be the best at tournament picks (which is highly unlikely), their advice would become so well known that the value of their advice would diminish. Information spreads rapidly and everyone has access to it. This is how the stock market and active money managers and mutual fund managers work. You pay a lot for their management with the hope they will deliver better performance, but in the long run, the vast majority underperform their benchmarks averages, which is the equivalent of the tournament committee’s seedings. We hope you enjoy the NCAA tournament and your picks are winners. It’s supposed to be fun. You can take some chances and risks. Your future is not dependent on it. But for investing, for your serious money and your financial future, we hope you understand the analogy here and follow our rational approach and investing philosophy.